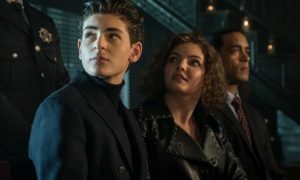 This week Gotham season 5 delivered an episode entirely about Oswald Cobblepot’s ego. They know what the fans want and it was delightful. It opened by showing that in the midst of this citywide emergency, Oswald forced a group of uniformed men to sing to him every morning. But, word got out that people have the option to find shelter with Jim Gordon. So, most of the people working for Oswald abandoned him. 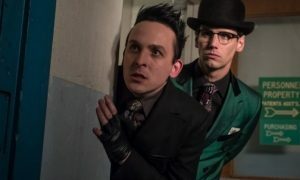 Oswald spent the rest of the episode being angry that people like Jim more than him. He swung from being a heartless villain to saving people just because he wanted people to like him. It wasn’t deep, but it was a fun exploration of Gotham’s most popular character. 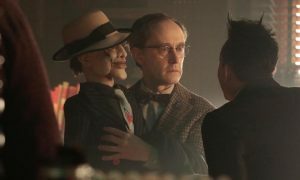 A villain with a deep desire to be loved isn’t exactly new territory, but the character details with Oswald always make it fun. I enjoyed every mention of his dog, who I still cannot believe is actually named Edward. Meanwhile, Selina Kyle and Bruce Wayne went after Jeremiah Valeska. Selina had a run in with Ecco. Visually Ecco is clearly Gotham’s Harley Quinn. Her wardrobe and makeup were strong and stylistically the character worked. But, it felt a little hollow. While many characters in Batman canon work primarily because of their style, so much of Harley’s appeal is her story and the depth of her pain. A lot of what Gotham does involves prioritizing which characaters to give genuine backstories and which ones to simply make sly reference to. I can see why someone would find things like Ecco saying “puddin” fun. But, to me, it felt like a last minute scramble to include one more important character. The storyline had more to say about Selina. She’s always been great, but we really saw her fully formed here. Gotham does a great job of balancing her romance with Bruce and her journey for independence.